The Robe was an interesting challenge. Originally I was going to base it on a Victorian Santa Clause Costume, which I already had, but seems to be out of print now. In shopping for some of the sewing notions for the costume, however, I found a Costume Pattern for the Dwarves in “The Hobbit”. This would require fewer modifications to match the image to the left and would require less fabric. Because the robe had to fit both Demetrius, and the person wearing the suit, I had taken the full measurements of both. As some of the measurements between the two varied as much as two inches, I made mock ups in two sizes, using old bed sheets for the material. The smaller size was chosen, as it fit both my client and the Demetrius. I did have to shorten it as the mock up length reached below the mid-calf, and he wanted it to be about knee length. Another mock up was designed then fitted. The vents for the wings and the slit in the back seam were also added at this time. The sleeves were also shortened. Demetrius wanted inside pockets to hold items like his phone and wallet and key cards for events like Conventions and Renaissance Faires. As he did not want to ruin the lines of the robe, I added lining to the facing the at front of the robe. We had another fitting to make sure the length was right and that the vents for the wings, the slit in the for the tail and sleeve length was correct. More modifications were made and applied to the the lining. edges, and arm holes carefully matched up. The edges and hem were then pinned together. I then attached the contrasting gold fabric to bind the edges except at the hem. The wing vents were an interesting challenge. I could bind them or something else. I chose some thing else. I attached a facing on the inside of the garment. It was partially interfaced. Once sewn on, I pulled it through the vent and carefully ironed it to lay flat then tucked under the edges.
. I ironed it down again and pinned it. Then has stitches the folded edges down. I should have made the facings a bit longer as you can see in the picture to the right the tops and bottoms pucker a bit. I will keep that in mind for the next project he commissions. Yes, we have plans to add more pieces. The next step were the sleeves. 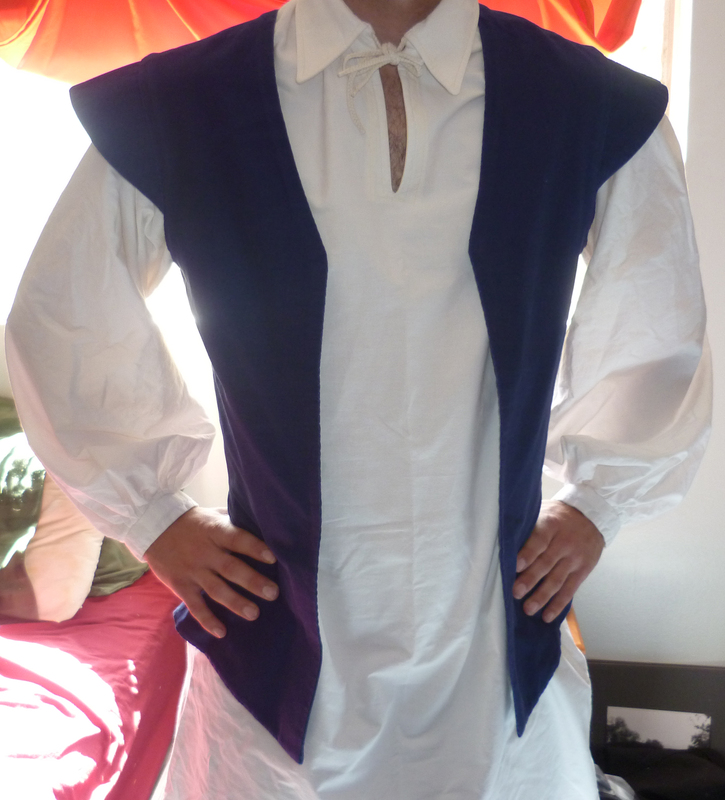 I stitched the lining and the sleeves together, and added the binding. I then attached the sleeves to the robe. We has one final fitting before sewing the binding onto the hem, to complete the Robe. Here is an attachment that you can use on your vintage straight stitch sewing machine for zigzagging and hemming. It has gears inside that function like the cams in other machines to stitch a pattern like a scallop or blind hem stitch. The above view gives you an idea of how big it is: about 4″ x 7″. Yes, that’s pretty huge for a thing that attaches where the presser foot normally goes. The stranger thing is that the entire unit moves back and forth as it works. It’s definitely something to get used to. The dial selects the stitch and levers change the stitch length and width. The lever on the lower left changes between straight and zigzag, just in case you need to stitch straight while the attachment is on the machine. Note the direction of the fork and the length of the presser foot portion. The fork tells you it won’t fit in rotary hook machines. It’s not as easy to tell that the length of the presser foot means it won’t fit in some machines. The difference is only a couple millimeters. Here’s how it looks attached. This really doesn’t do the size justice. Bonus: like other mechanical attachments, such as buttonholers, you can see how it works by taking off the cover and you can clean and oil it yourself. It turns out there are at least two versions of this unit. This one is considered grey, white or silver and is intended for White or other similar brand machines. There is also a gold unit that is for Singer and Kenmore. The difference is in the length of the presser foot, which doesn’t allow the needle hole to line up with the machine. I have the wrong attachment for the brand of machines I have. If anyone in interested in this one let me know. I believe I paid $13-$15 + shipping for it. It comes with detailed instruction manual and original box (which closes but no longer clasps). I was recently given a group of vintage sewing machine attachments. They are a little different than modern sewing machine feet, but were pretty standard for several decades. Griest attachments. Top left: four sizes of hemmer, a five stitch ruffler. Middle: a binder, edge stitcher and adjustable tucker. Bottom: a gauge, narrow hemmer (rolled hem foot) and lint brush. Greist attachments are basically the same as old Singer versions. They can be used interchangeably. The great news is that they are also useful on modern machines as long as the shank is right (high, low, slant) or you have the correct adapter (ankle) for snap on feet (snap ons are more modern). One other thing to watch out for is the direction of the fork that connects to the machine. The ones in the above image are for a rotary hook machine, as opposed to an oscillating one. Note the horizontal fork attachment. Here is a discussion about how oscillating and rotary machines function and the pros and cons of each. At this time I don’t know why feet for a rotary hook machine would attach differently when the difference in machines is in the mechanism surrounding the bobbin, so if you know, please share in the comments. Different types attachments for different machines. On the above image you can see a snap on foot for a modern machine (top left) and it’s low shank ankle (top right). Below that we have a low shank binder foot (left) and one for a rotary machine (right). Note how the one on the left wraps around the presser foot bar, just like the ankle, while the rotary foot has a horizontal fork. The rotary attachments will not fit any of my machines unless there is some clever adapter I don’t know about. To further complicate sewing machine feet, there can be differences between needle hole placement in general, as well as between brands. Era of machine is also a factor. With some feet you can use your needle position adjustment to move the needle side to side so the needle does not strike the foot. Some machines, however, have the needle position father forward or backward. For example, a complicated Automatic Decorator foot for a vintage White will not fit a vintage Singer or Kenmore (or a modern Huskvarna, I tried for giggles). The needle position is wrong on the back to front axis. There is no adjustment for this. The same could be true of a foot that has only a hole opening. I will discuss that Automatic Decorator in another post this week. Additionally I got these other pieces that I think are three different sheering feet, a zipper foot (upper right), second from the top left is for a straight stich machine most likely, but I’m not sure why it’s hinged (it moves up and down about 1/4″). The plate on the bottom looks like it’s for attaching trim, but who knows what machine it goes to.